The last time we checked in with Archer Exploration (ASX:AXE), we told you about the graphite player with the biggest resource in the country. At that stage, AXE was putting its business strategy together and had taken its first tentative steps into portfolio diversification. Not because graphite is expected to tank, far from it. Instead, this portfolio diversification gives AXE many more bites at making money. AXE’s path to diversification is impressive. First, this junior mining player entered into the agriculture game – because its graphite at a key deposit showed more promise as a fertiliser than a straight graphite play. AXE also ramped up its interest in magnesia as the result of a key industry closure in the region, seeking to take advantage of an infrastructure sell-off. This $7M capped company has shown that far from being a miner with one thing on its mind, it is able to move around the spectrum to find the best deal for shareholders. And it has been busy doing just this. Since we last wrote about the stock, AXE’s South Australian Campoona graphite has been researched and tested at the University of Adelaide’s School of Engineering and delivered ultra-pure graphene above 99.9%. Graphene is one single layer of graphite with impressive properties and can be used in everything from phones, to water, tennis racquets and even bionic devices in living tissues. Meanwhile, in a move that should further please shareholders, AXE has also jumped on the closure of the famous Leigh Creek coalfield which opens up an opportunity for a new magnesia-based mining venture. Of course it is early days in this development and should not be taken as something that will have an immediate impact on the company, so when considering AXE for your portfolio take into account all investment factors, including your own personal circumstances. In the meantime, we’ll run you through all these developments, and more. While graphite isn’t all AXE has on its plate (we’ll go into that later), it is the main game for this promising explorer. 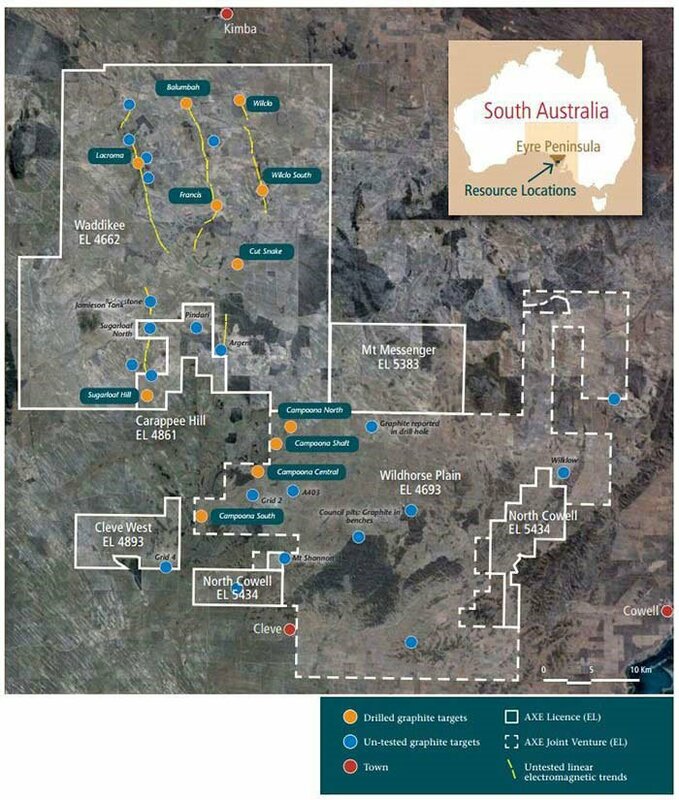 AXE’s graphite strategy is mainly centred on the Eyre Peninsula in South Australia, with its main targets outlined below. At the moment, AXE has an 8.55 million tonne graphite resource with an average grade of 9% graphite, for a total of 770,800 tonnes. 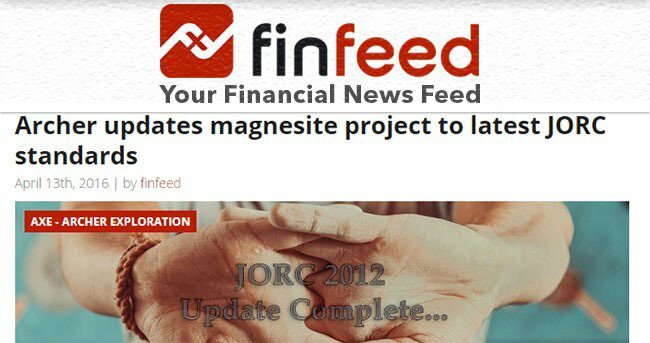 That makes it the largest single resource of graphite in Australia. However, plenty of you would have noticed from the map above that the current resource isn’t the end of things, with plenty of exploration upside in the pipeline. The overall plan from AXE is to mine 10,000 tonnes of graphite ore per year and then process it at a facility based at Sugarloaf Hill. At the moment, AXE is planning to produce a high-purity battery-ready graphite at more than 98.5%. It is currently looking for mining approval of 1.65 million tonnes of ore per year from the government, with the Sugarloaf facility to become the central hub for a spoke-and-wheel operation. That approval is with the South Australian government at the moment, and approval is expected before the end of the second quarter. There are three key projects which will underpin the spoke-and-wheel processing plan; Campoona, Campoona Central, and Wilco South. Campoona really is the star of the show for AXE and is its most advanced prospect. It’s the proposed centre for the aforementioned processing facility, which will be fed by ore from the Campoona Shaft. The plan at Campoona is to mine for 14 years in an open pit down to about 100m to keep production costs low, but there is even further exploration potential below this, as you can see from the cross-section here. Given that the forward plan is to mine for 14 years, it’s clear that there’s plenty of graphite – but what about its quality? Well, on that front AXE has been kicking all the right goals. Back in May, AXE took a sample of the graphite from Campoona Shaft to the CSIRO to see how it ran against on-market synthetic graphite. Synthetic graphite is used in about 32% of all lithium-ion batteries as it has excellent electrical conductive qualities, but being synthetic, it costs more to produce. If AXE could somehow produce graphite (subsequently graphene) with the performance of synthetic graphite then it could well and truly be at the races. The results from the CSIRO testing was glowing, to say the least. It found that AXE’s graphite could compete with synthetic graphite . Given that AXE’s graphite is natural, and therefore cheaper to produce, it means AXE could well and truly be onto something here. However, it should be noted that this was a lab test only; not full scale production. So AXE is in the early stages here, and it should be noted that this is a speculative mining stock, with more hurdles to come as the company attempts to move into production. 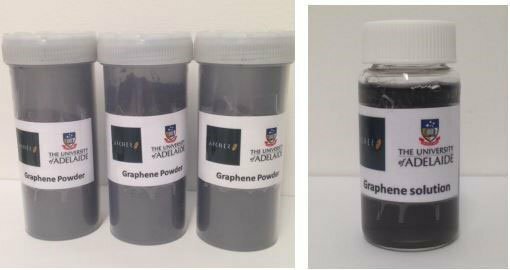 More recently, it got word from the University of Adelaide that its Campoona graphite can deliver graphene at more than 99.9% purity. It literally doesn’t get much better than that. AXE has been working with the University for a while now, and the results of the latest testing make for great reading . The boffins at the University have come up with a way to produce ultra-pure graphene with fewer chemical processes. At this stage both AXE and the University think that the processes can be scaled up, but testing scheduled to take place this year will bear that out. Given that the numbers on Campoona graphite processing already stacked up, news that it could use fewer processes for greater purity can only be read as a broad positive. Here is the graphene powder and graphene water dispersion prepared from AXE graphite. And here are selected graphene products produced from Archer graphite: graphene conductive film, conductive flexible polymer, graphene composite and electrodes for battery and supercapacitor applications. When having a look at the results from the University of Adelaide studies, it is worth noting again that results show that high quality graphene can be prepared from AXE’s Campoona Shaft graphite and that preliminary characterisation of these products confirm electrical conductivity that has potential to be used in applications for solar cells, photovoltaics, wearable/printable electronics, supercapacitors, batteries and sensors. That’s a great place to be in, given the predicted surge in demand of these important futuristic applications. After the development of the Campoona shaft, the next cab off the rank is the nearby Central Campoona. Luckily, tests back in August indicated that graphite from Central Campoona had properties consistent with the graphite from Campoona . It effectively means that AXE shouldn’t need to alter its processing or flow sheet all that much to process both Campoona and Central Campoona graphite. Imagine the cost in having to change things up for processing different graphite types. Of course the proof is in the actual processing, but all the signs are positive so far. It opens the possibility that AXE could seek to expand the 10,000 tonne per year processing capability of the centre at Campoona to accommodate the extra supply, but AXE has been tight lipped on this so far. On a raw numbers basis, Central Campoona could add another 23% above that at Campoona. At the same time, this bolster to resource quantity is somewhat speculative and should not be considered the be all and end all, so exercise caution when considering this stock for your portfolio. Only 20% of the targets at Wilco South have been tested with the drillbit so far, and yet it makes up a large chunk of AXE’s overall JORC resource. On its own, Wilco South has a JORC resource of 6.83Mt @ 8.8% graphite (based on a 5.5% cut off) and has a potential mine life of 20 years. Yet, none of this was taken into account when coming up with the current processing plan. AXE has previously said that the deposit at Wilco South remains open to both the north and south, so who knows how big this could end up? Is 2016 the year of graphite? There’s a few key reasons why people are talking about graphite as one of the next breakout commodities. One of them is the use of graphite (and graphene) in lithium ion and next-generation batteries. The thing about graphite and graphene in particular is that it’s an excellent electrical conductor, it’s a highly malleable metal and strong, so it’s sought after by those making batteries. But it’s not just electric car makers who are seeking to tie up graphite sources, as graphite is fundamental for the production of graphene, which is being hailed as a potential wonder material . For instance, graphene maintains integrity at some truly huge temperatures, making it great for use in engines – amongst a host of other futuristic applications. While you may have heard of graphene before, it’s only fairly recently that the material has started to make its way out of the lab and into the real world. This is a chart we’ve used before; it’s the number of graphene related patents filed worldwide over the past few years. As you can see, there’s been a huge ramp-up in patents from about 2010 to now. That’s a pretty clear indication graphene is starting to make the leap from the lab to the commercial world. In mid-2015, Samsung announced that it was experimenting with lithium ion batteries (with graphene a key part) in an effort to double battery life for smart phones. Samsung says the solution is to grow graphene cells directly on the silicon layers to allow for the expansion and contraction of the silicon and increase the battery’s capacity to store two times as much energy as lithium-ion batteries with graphite anodes. 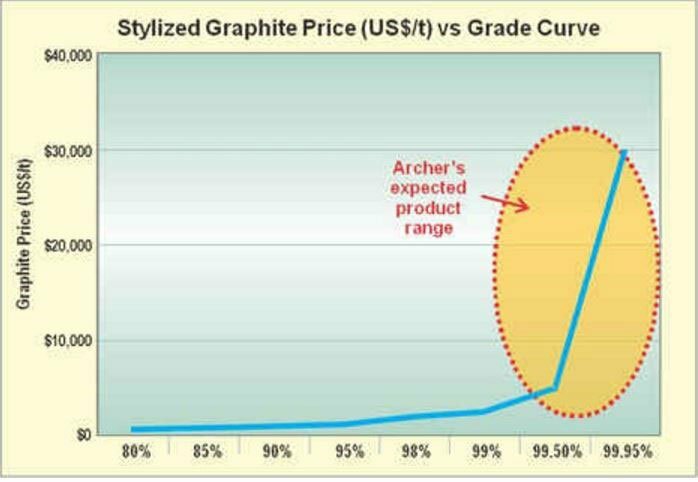 This potential is starting to get priced into the graphite market. Despite some weakness in the price around 2012, the overall price of graphite has held up fairly well. However, the real game comes into play when you start producing the high-grade stuff. A $7 million diversified 21 st century commodity company? AXE is starting to show that is it building a diversified commodity base, and the theory behind it is pretty sound. While the market for graphite is pretty good, it can’t hurt to have several pieces of the shareholder wealth pie in the back-pocket just in case. Taking a step back from the Eyre Peninsula, you can see that AXE has a number of opportunities in the portfolio. Having a couple of opportunities at creating a great business is generally advised, but AXE has about five or six on the go. These are future opportunities and are being pursued with varying degrees of intensity, it should be mentioned, but simply lining up the ducks shows great aptitude. The graphite market is really quite robust (we’ll talk about that later), but AXE is playing a prudent game. In our humble opinion, the sign of a great company is how it deals with adversity. It’s all well and good going headlong into a plan, but that if it doesn’t come off? Do you just give up? In AXE’s case, it has turned some potentially bad news into something that could be huge. Back in the day, the original plan was to mine graphite from near the site of the planned processing centre, at the Sugarloaf project. Only, there was a slight snag with that. It turns out the graphite there isn’t really all that suitable for processing. Testing at the University of Adelaide found that the graphite resource at Sugarloaf was essentially immature and didn’t form crystalline graphite – which is the kind of graphite needed for processing. But, AXE found a silver lining in the bad news. 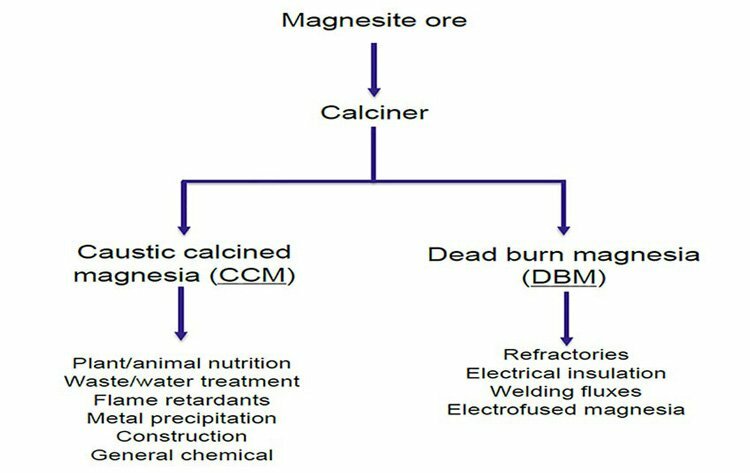 It turned out that the testing also confirmed elements in the graphite such as potassium, phosphorous, magnesium, iron, copper, zinc, manganese, boron, and calcium. These weren’t present in large enough quantities to be mined in their own right. That in itself is a roadblock, but again AXE was able to find a way forward. It decided to investigate the resource as a potential fertiliser, which could allow it to sell its product to the farmland directly around the mine gate and improve soil quality. At the start of September last year (2015) the University of Adelaide confirmed via a 30-day trial that plant growth is “significantly” boosted when raw graphite from Sugarloaf was used as a soil conditioner. This was backed up by further testing at the start of December . It essentially means that AXE has just opened up a whole new potential revenue stream. It has the potential to be a second commercially viable graphite-based product, in addition to its straight graphite play. The best thing about it is that testing has indicated that very little processing would be needed to turn the Sugarloaf graphite into a viable product. In fact, all it would need to do is crush, bag, and sell to surrounding farmland. 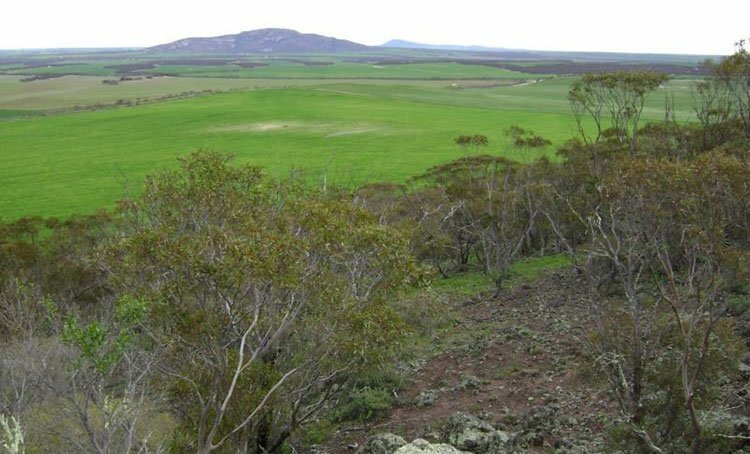 The dryland sandy soils that predominate the region could certainly benefit from AXE’s product, and this could extend to the grain growing areas of South Australia – as a start. It also positions AXE as a player in one of Australia’s best hopes for a new mega-industry. You would have heard a lot about agribusiness lately – for good reason. 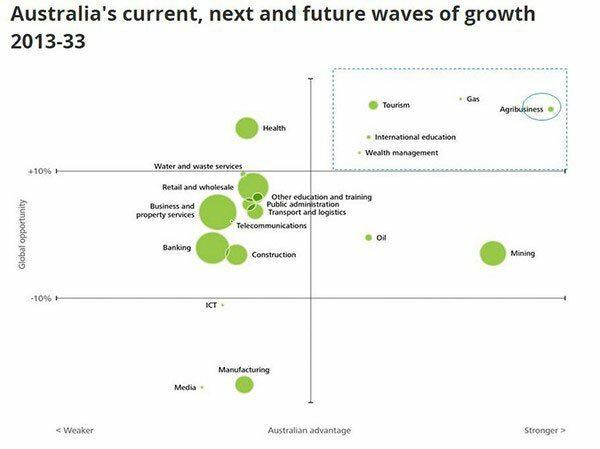 The above chart is from Deloitte Access Economics, and spells out some of the future economic opportunities Australia has through to 2033. Right in the sweetest of sweet spots is agribusiness. The same Asian growth which fuelled the iron ore boom of years past is the same growth which will put a rocket under the agriculture economy the world over, and Australia is uniquely positioned to take advantage. With free trade agreements recently kicking in with Japan, South Korea, and crucially China there’s been no better time to be in the game. And with Indonesia also booming, and India expected to roar in the next decade, the opportunity for primary producers is huge. Key drivers of global demand are lifting, including population growth in key markets. Global food demand will rise alongside the world’s population, which is expected to grow by 60 million people a year over the next 20 years. Many of these new citizens will be in India and Africa. Viewed another way, the world’s population will rise by the size of India today. But that is just the increase in baseload demand. Income growth in key markets will be much more important still. As incomes rise in emerging economies, so too does kilojoule intake and, more importantly, a switch to protein takes place. The latter will power a dietary shift from grains and cereals towards meat, dairy, fruit and vegetables. That means a swing to more intensive land use. Simply put, the world is on the cusp of a leap in demand for higher-value food products. Feeding this market will need fertiliser to grow the feedstock which will in turn feed the livestock. It’s simply too early to know how large a part AXE will play in this story, but all the potential is there for this to be a handy money spinner for AXE. AXE has always had a wild hair toward developing a magnesia-based project at Leigh Creek, to the north of its current projects. It has its foot on a potential magnesia resource of 453 million tonnes at a 41.1% magnesium oxide grade. This makes it potentially Australia’s largest resource, but the problem was that the numbers simply didn’t stack up, with far too much money needed to get the infrastructure right. It would have required simply too much to get all the ducks in a row for this one. We said before that a good company knows how to find the silver lining in bad news, and AXE has pulled off this trick again. Back in November, the community in Leigh Creek got bad news with Alinta deciding to shut a coal-fired electricity plant in the area. That plant had become uneconomic for Alinta to run, but was a big employer in the region. However, with Alinta pulling out, AXE saw an opportunity, having already signed a heads of agreement with Leigh Creek Energy to explore synergies. The coal plant closure would leave behind a lot of associated infrastructure, infrastructure with a capital cost that AXE could not have borne at this stage in its lifecycle. “Development of this valuable resource has previously been restricted by both the lack of infrastructure and the inability to access existing Leigh Creek coalfield infrastructure,” chairman Greg English said at the time. He added that it had already been in talks with the South Australian government about a potential project. No matter how promising a project is on its own merits, it is pretty much at the whim of international markets when all is said and done. Luckily for AXE, it’s sitting in a market which is expected to host one of the boom commodities for years to come. It has, however, made sure it’s got plenty more on the plate by transforming itself into a diversified commodities player. From graphite to agriculture to magnesia; AXE has positioned itself to take advantage of not just one boom market but several .